In the report, each of the assistants were asked 5,000 questions. Google Assistant answered 3,405 of those questions with a 91% accuracy rate. Cortana answered 2,825 of the questions with an accuracy rate of 82%. From there however, the gap increased significantly. Apple’s Siri only answered 1,085 questions with a 62% accuracy rate. 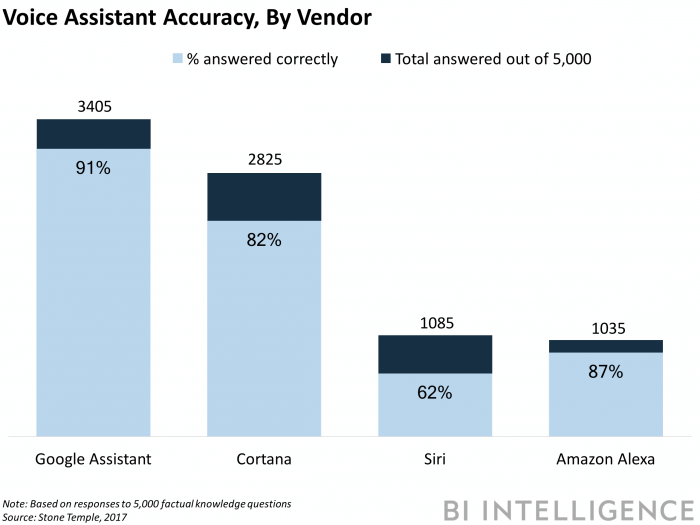 Amazon Alexa finished up last with 1,035 questions answered but had a higher accuracy rate than Siri or Cortana at 87%. Another interesting facet in all of this: While Apple will be leveraging more of Google technology in Siri, Amazon has already partnered up with Microsoft to inject Cortana into Alexa powered devices. That means the two laggards in the report will likely close the gap significantly in the next few quarters as the technology integrations take shape.